Uneasy lies the head that wears the crown. With the power, comes great responsibility. 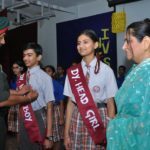 In keeping with the tradition of the school, once again before the commencement of the new academic session 2017-2018, the Investiture Ceremony of SSICS was held on 18th April 2017 in the School Auditorium. 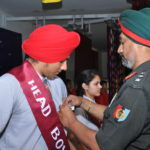 The guest of honour was Col Jasbir Singh Cheema, Commanding Officer 3, Punjab Coy Rupnagar. The newly appointed Head Boy- Savroop Singh, Head Girl- Amanjot Kaur,Dy. Head Boy-Vinayak Gupta, Dy. 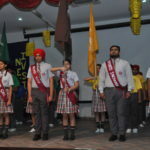 Head Girl-Aanchal Thapa, Activities Incharge-Ishleen Kaur, Sports Incharge- Arshdeep Singh and Captains of all four houses alongwith the other cabinet members were sworn in by the Principal so as to shoulder their newly assigned responsibilities to the utmost of their ability, integrity and dedication. She appreciated the services rendered by the previous office bearers who did full justice to their posts and urged the new appointees to do their duties with loyalty and told them to honour the trust bestowed on them with full commitment. Later on the new appointees had a meeting with the Principal over a cup of tea and refreshments.